Your chiller is tasked with an important job to maintain cooling without interruption. 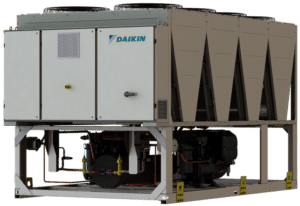 When your machine isn’t performing properly and seems to be in need of chiller repair, you need a company that you can trust to provide excellent service. Have confidence in Alpha Energy Solutions to deliver chiller service and repair year-round for both commercial and industrial buildings. A broken chiller in need of repair may slow down productivity in your facility. Lack of cooling may cause an uncomfortable environment and issues that are not addressed with chiller repair quickly may lead to more severe problems in the long run. In some cases, an operation may run multiple chillers at one time, in others, a single chiller that is broken may lead to troubling results. When you need chiller repair, trust Alpha Energy Solutions to provide remarkable service and support. We specialize in HVAC. In fact, our technicians have over 2,000 years of combined experience in the field. We handle chillers of all sizes and capacities. There is no chiller repair that we cannot handle, our expertise speaks to our full capabilities. Chiller repair by Alpha Energy Solutions is backed by service and selection. When it comes to the parts needed to begin or finish repairs, we have access. We deal with all of the top brands in the HVAC industry through a large distributor network. Our relationships mean that we can acquire parts when you need them and offer a faster turnaround time on your service calls. Our technicians are on-call 24 hours a day to handle service calls. Even in emergency situations, you can anticipate that our technicians will be available to answer your calls. We deliver and install brands names that you can trust. Still, your machines need to be updated regularly to deliver the best performance. We offer Preventative Maintenance Programs which can be customized to your machinery. The plans are a great way to ensure that you stay ahead of potential performance issues through constant monitoring, reporting and preventative service.